It is with regret we record the death of Mr Charles John Phipps, the well-known theatrical architect, whose latest completed work in the metropolis was Her Majesty's Theatre. Mr Phipps died on Tuesday morning, somewhat suddenly, at his residence, 26, Mecklenburgh-square. On Saturday he went to Dover, where he was building a theatre, and, contracting a chill on the return journey, took to his bed on Sunday. He had been suffering from a heart affection for some time. Right - Her Majesty's Theatre, London - From a period postcard. Mr Phipps was born in the year 1835, at Bath, and practiced in that city before he came to London. While at Bath he competed for the design for the erection of the new theatre there, and it was in consequence of the success of this building that he was employed to build others, and therefore settled in London in order to attend to the large practice which awaited him. He transformed the Strand Music Hall into the Gaiety Theatre, and since then has been engaged in the construction of a large number of theatres in all parts of the kingdom. The London theatres erected or reconstructed from his designs and under his directions include the Queen's, in Long-acre (formerly St. Martin's Hall; the Prince of Wales's, the New Princess's, the New Strand, the Savoy, the Lyric, the Vaudeville, Sadler's Wells, the Haymarket ; the Varieties, Hoxton ; the Shaftesbury, 1888 ; the Lyric, 1889 ; Hengler's Cirque (now known as the National Skating Palace) ; the theatre of the Lyric Club, the internal reconstruction of the Lyceum, Comedy, St. James's, and Globe Theatres ; the superintendence of the Garrick Theatre, 1889 ; and the Tivoli Theatre, 1890 ; the Queen's Hall (jointly with Mr Knightley) ; and Her Majesty's Theatre, Haymarket. The provincial list includes the Theatre Royal, Bath ; Prince's Theatre, Bristol ; Theatres Royal, Plymouth, Torquay, Brighton, Eastbourne, Swansea, Worcester, Nottingham, and Portsmouth; the Empire Palace, Portsmouth ; Theatres Royal, Sheffield, South Shields, and Darlington ; the Gaiety Theatre, Hastings ; the Opera House, Leicester; the Opera House, Northampton ; the Opera House, Leamington ; the Rotunda, Liverpool ; the Alexandra (reconstructed), Liverpool ; the Grand Theatre, Wolverhampton; and the Tivoli, Dover. Left -The Prince's Theatre, Bristol from a period postcard. In Scotland : The Theatre Royal, Edinburgh ; the Lyceum Theatre, Edinburgh ; Theatre Royal, Glasgow ; Theatre Royal, Dumfries ; Her Majesty's Opera House, Aberdeen. In Ireland : The Gaiety Theatre, Dublin ; the Leinster Hall, Dublin ; Theatre Royal, Belfast ; Theatre Royal, Londonderry ; the Royal and Opera House, Cork. Mr Phipps held the appointment of architect to the proprietors of Drury-lane Theatre for fifteen years, and has acted as consulting architect to the Government at Cape Town for the improvement of the acoustics in the House of Assembly and for the theatre there, and also to the proprietors of the Theatre at Kimberley, S.A. 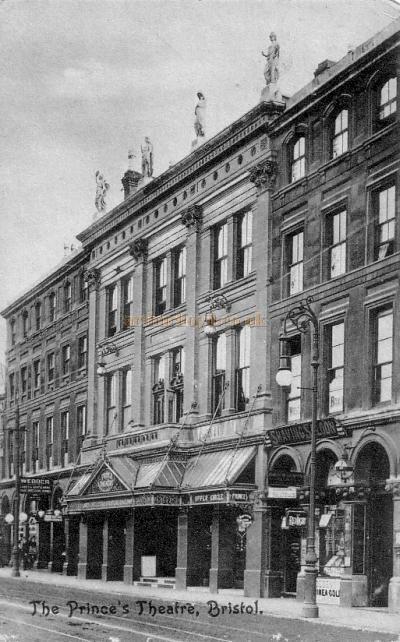 Some of the other important public buildings erected from the designs of Mr C. J. Phipps included the Devonshire Club, the Lyric Club, the Gaiety Restaurant, and the hotel in Pall-mall and the Haymarket now being erected on the site of Her Majesty's Opera House. We understand that the late Mr Phipps's partner, Mr Arthur Blomfield Jackson, will carry on the various works with which they have been associated, and will continue the practice at 26, Mecklenburgh-square. The funeral took place on Friday. The first part of the Burial Service was solemnised at the Church of St. Alban the Martyr, Holborn; and the remains were afterwards interred in Highgate Cemetery. The above text on the death of C. J. Phipps is from the ERA, 29th of May 1897. Above - C. J. Phipps' Carlton Hotel under construction, but only completed after his death by Isaacs and Florence. 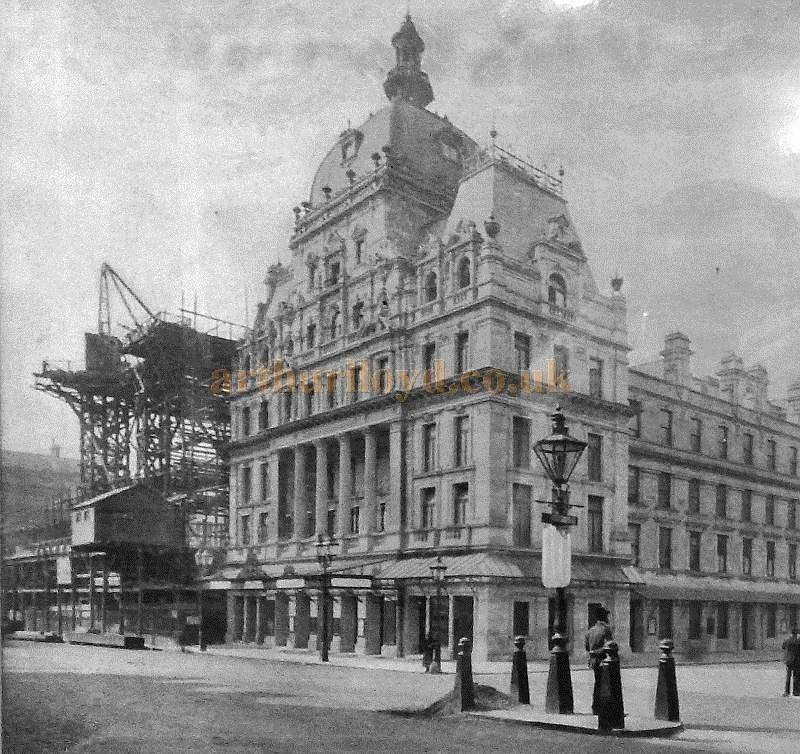 The Hotel was a companion to Her Majesty's Theatre, also shown in the photograph, and also designed by Phipps. The Carlton Hotel was eventually demolished to make way for the present and rather obtrusive New Zealand House next door. We regret to announce the death of Mr. CHARLES JAMES PHIPPS, F.S.A., the well-known theatre architect. Mr. Phipps, who was sixty-two years of age, had been suffering some time from a complication of affections of the heart and kidneys; but as he lived above his offices at 26, Mecklenburgh-square, he was able to continue his work almost until the last, and felt, indeed, sufficiently strong to run down to Dover on Saturday, to inspect the new Tivoli Theatre there, approaching completion from his designs - his seventieth edifice of this class. During the journey he took a severe chill, which compelled him on Sunday to keep his bed, and death took place on Tuesday morning. 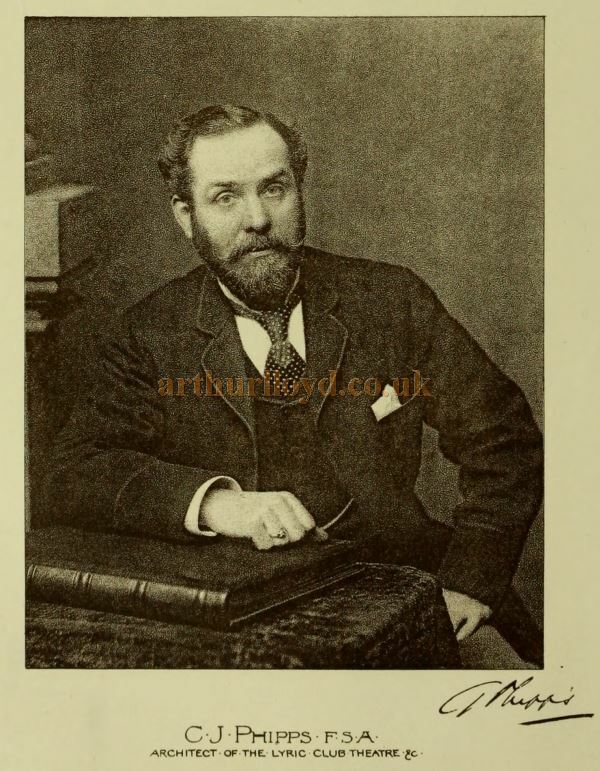 Born in 1835, he was articled to Messrs. Wilson and Fuller, of Bath, with whom he remained till 1857, when he commenced practice in his native city of Bath. His first great work was the rebuilding of the theatre in that city in 1862, after its destruction by fire, a commission gained in competition, and one which gave a turn to all his future practice. 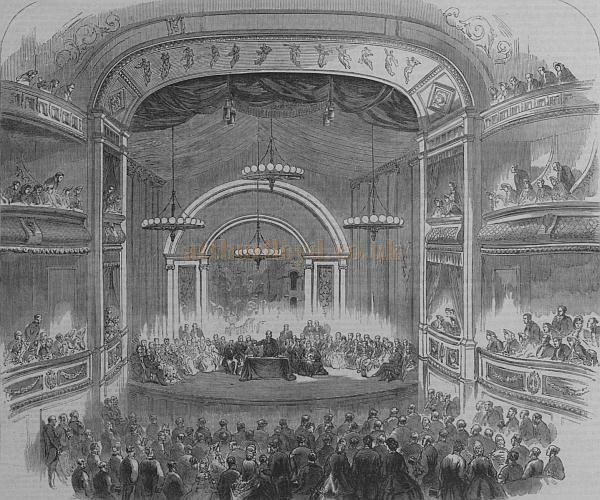 Right - The auditorium of C. J. Phipps' 1863 Theatre Royal, Bath, during a meeting of the British Association in 1864 - From the Illustrated London News September 1864. In 1866 he removed to London, and he has since enjoyed for many years the foremost practice in theatre work. 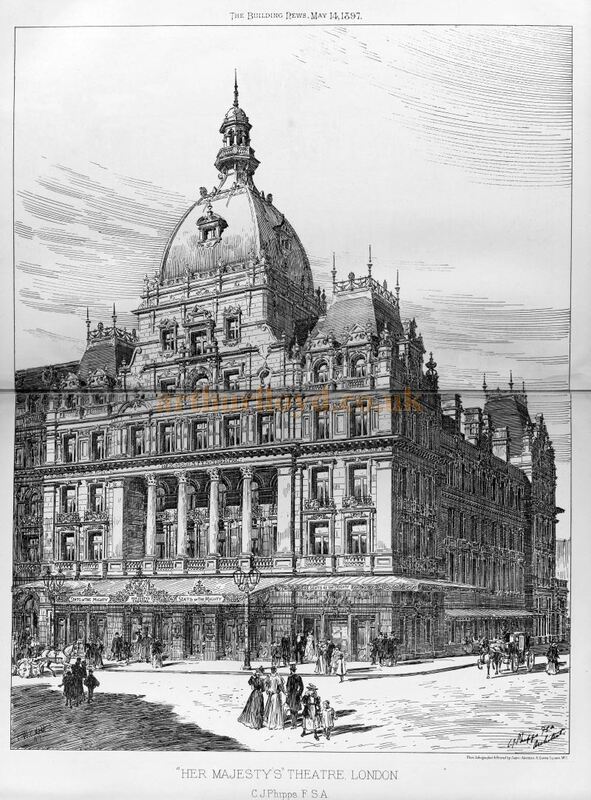 Among his buildings in the Metropolis may be named Her Majesty's Theatre in the Haymarket, opened less than than three weeks since, and illustrated by a signed double-page perspective from his own hand in our issue of the 14th inst. 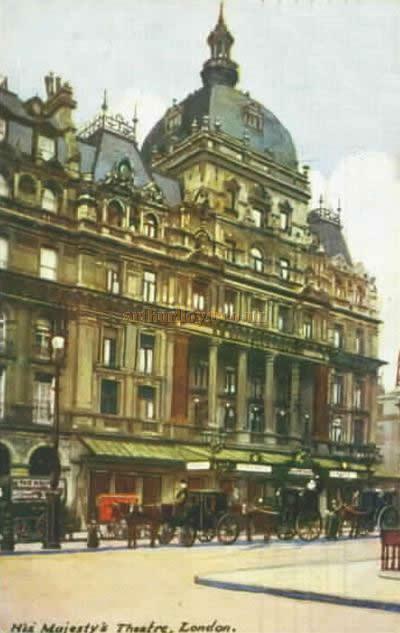 (shown below) - the Carlton Hotel adjoining is still in course of erection from his plans; the Lyric Club and Prince of Wales's Theatre in Coventry-street, forming externally one block of buildings; the Gaiety, Savoy, Comedy, Shaftesbury, Princess's, and many other theatres; the Devonshire Club, St. James's-street; the Savoy Turkish Bath; extensive flats in Portland-place; and the pavilion buildings and cloakroom at the Star and Garter Hotel, Richmond. He designed and carried out between 40 and 50 theatres in the Provinces, including the Royal and Lyceum at Edinburgh, and others at Dublin, Belfast, Cork, Londonderry, and Bristol, Plymouth, Exeter (the scene of a disastrous fire some years past), Northampton, Nottingham, Worcester, Liverpool (two), Swansea, Torquay, Leicester, Portsmouth (two), Brighton, Eastbourne, South Shields, Leamington, &c.
His practice was not confined to this class of work, for he also rebuilt Lea church and added the schools; schools and a mortuary chapel at Pewsey; Leinster Hall, Dublin; the militia barracks and stores at Bath; and the Assize Courts and Guildhall extension at Swansea. Until the death of Sir Augustus Harris he held the appointment of architect to the Company of Proprietors, Drury Lane Theatre. 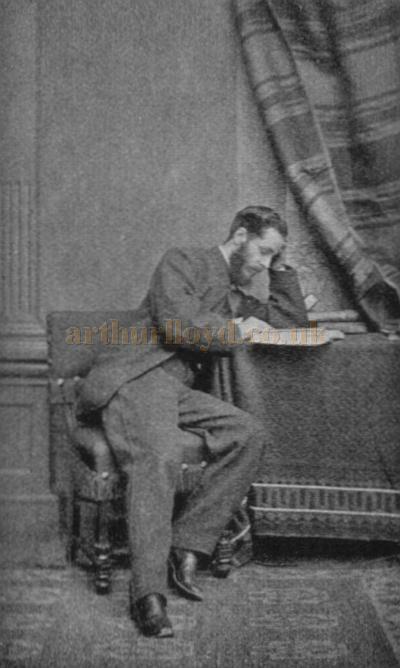 Mr. Phipps joined the Royal Institute of British Architects as an Associate in 1860, becoming a Fellow half-a-dozen years later on his removal to London; he had read several papers before that body, and served for two years on council. He leaves a widow, three married daughters, and one son, Mr. A. Rashleigh Phipps, the well-known electrical engineer (Rashleigh Phipps and Dawson, Gray's Inn-road). Mr. Arthur Blom-field Jackson, who has been in partnership with deceased, and who has been associated with him in his more recent works, will carry on the practice at 26, Mecklenburgh-square. We gave a portrait and biography of Mr. Phipps in our issue of April 18, 1890 (shown right). The above text is from Charles John Phipps' Obituary in The Building News and Engineering Journal May 1897. Some archive newspaper reports on this page were collated and kindly sent in for inclusion by B.F.